Sowing grass seed where a blow-up pool killed the grass in my backyard. Cutting weeds out of the bushes against my house. Vacuuming the finished section of the basement. Clearing clutter out of my house. Sitting in my sunroom in my house slippers writing a story. Two months have passed yet I’m still not over it: four years of mental grind has taken tangible form. This box arrived last November. Opening this box is my favorite part of the publishing process and must be one of the most rewarding moments of being a writer. It’s like being handed your newborn baby for the first time. The car keys to your dream car. A college diploma. The hard work to achieve this prize is over. You’ve dusted off your hands and opened a new door. And there’s a sprawl of endless possibilities right at your feet. I just added another paperback to the stack on my nightstand and stepped back and thought, wow. This needs to be frozen in time. I got my camera and snapped a pic without touching a thing. Notice the two separate stacks of manuscripts pages. Three, actually, considering some are folded in half. Two laptops–the oldest one I use for most of my writing (Dell Latitude D430 FTW!). And an iPad, which I rarely use. Yet, the books far outnumber the electronics. I think I’m behind in my reading. 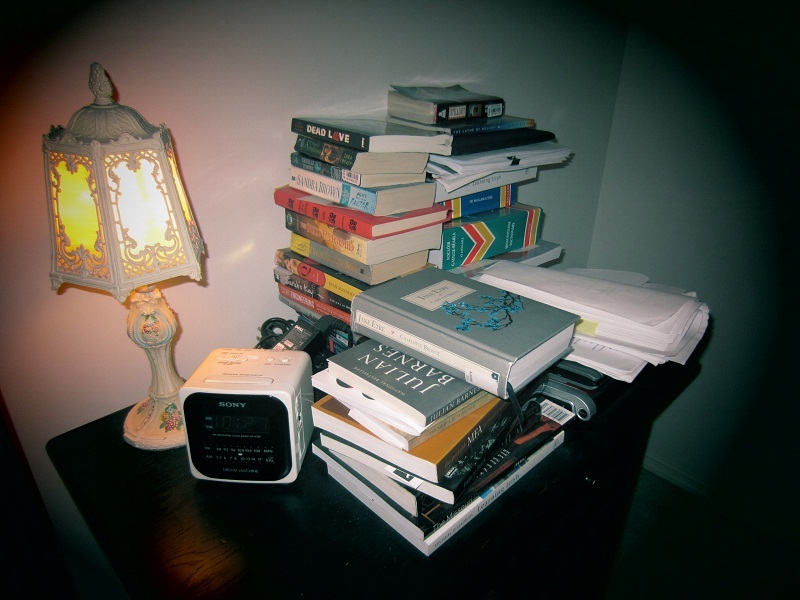 Now, take a pic of your nightstand and post it!